Time Period: 1950’s – 1960’s. 1972. 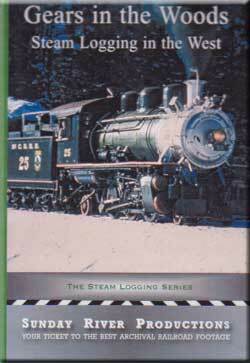 Twelve logging line operations are visited in this show. There is a chapter menu which is convenient. This DVD program has been digitally remastered in 2007. Hey, this is loaded with rare footage. Shot with all steam on the loggers. I will discuss some highlights. There are no lowlights. It is all good, high quality film. Alva Morrison; narrates, produced and some film credits. Southwest Forest Industries around Flagstaff, Arizona. The Coconino National Forest is known for the tall, Ponderosa Pine trees. A basic map illustrates the logging lines, as they appeared. Mainline Santa Fe is recognizable at the north, running right thru Flagstaff. The spiderweb looking SFI ran mainly south, and also, to Mormon Lake vicinity. It is a multi era map. Narrator gives a clear explanation of how to read the illustration. The heavy lines show what was active at the time the film was shot, lighter lines were still used in the 1953 consolidation, lightest lines were abandoned in the 1930’s. The map does give me a good sense of the area, where the film action will occur. Clever use of a single hand drawn map! The segment is all color. Steam power pulls the log trains in the woods. A brief, but good look. Outstanding, classic steam action! All of the other segments are addressed in similar fashion. Well organized, easy to follow. West Side Lumber Co. ( Narrow Gauge). This map shows 4 big trestles, and superimposes 250 miles of twisting branchlines.Logging camps are layered over that map. This operation must be seen to be believed! The narrow gauge line bends and twists in the forest. It has all the makings of a great model railroad. Steam era footage with many classic views. The trestles are large enough to be called bridges. Huge, raw logs, river floating, action at the lumber mill is all here, This longer segment that does satisfy. My personal favorite. Sweet! Feather River Railway in Plumas National Forest, Oroville Reservoir Area. Grades up to 5.5%. Shays are the power on this line. Klickitat RR was run off the SP&S mainline. Shay#7, lettered for St. Regis Paper Co.
Rayonier had 2 operations with 15 steamers each. Both operations are visited. Wide variety of power was used. The 2nd operation seen is Grays Harbor. Big and managed like a full-sized railroad. They could have 15 active trains. Connected with Northern Pacific. This segment is something to see. Wow! MacMillan Bloedel is at Vancouver Island, British Columbia. Hillcrest Lumber in the center of Vancouver Island with a Climax for the locomotive. Yreka Western connected with Southern Pacific. Lumber mills were serviced. This is vintage passenger and boxcar traffic. Quite a bit of history is discussed. McCloud River Railroad, near Mt. Shasta is shown with steam engines. This line seems to get the longest feature. Nice footage. 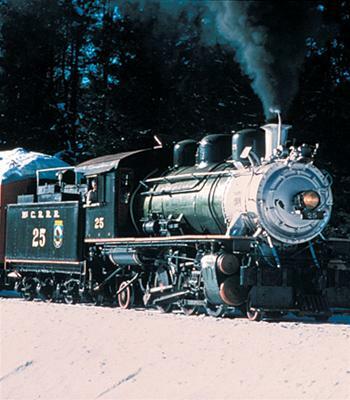 A 1969 double-headed excursion is viewed with #25 in special paint. Really good segment. In fact, this railroad digresses enough from log pulling, to keep things interesting. January, 1972 shows more McCloud action. A 1925 Prairie type was the last steamer out on an excursion, in the snow, pushing a snowplow! Considering we are looking at so many different lines and years, the imagery is consistent. Natural sounds are mixed with musical backgrounds. There is a sense of balance in this program. The pace moves along, the narrator drops in with info and sits back to let the trains be heard. This is a thought out and finely presented Logging Lines presentation. I would have liked information on the depicted locomotives. Some is present, to be sure. There is such a wide variety of steam engines, and I would have liked to learn of those shown. Callouts as to the type and some background, would have enhanced an already fine production, into an outstanding one. Everything else is superb. It is all color, all steam, and classic action abounds. Suitable for everyone. Puffing steam engines, ringing bells and wooded scenery make for engaging trainwatching. Kids will like this one. A fine, quality program. If you are a big logging fan, you may rate it even higher. This entry was posted in ATVR Reviews, Steam Train Reviews, Sunday River Productions and tagged American Train Video Reviews, California, Logging, narrow gauge, Railroad, Southern Pacific, Steam, Steam engine, steam train, Train DVD, transportation by William J. Hudson. Bookmark the permalink.